November 29, 2016 November 29, 2016 Dan O. Always keep those phones charged, kiddies. When Rebecca (Teresa Palmer) was a kid, she battled through all sorts of demons, in-personal and personal. Whenever the lights out went out at her place, scary things began to happen, which made her question life and her own existence as a whole. Now that she’s older and out of the house for good, she feels as if she finally has left all that behind. Her mother (Maria Bello) is still a little cooky and definitely doesn’t have a firm grip on reality, but her little brother Martin (Gabriel Bateman), who she looks over, does and that’s all that matters to her. However, the strange entity that once threatened Rebecca is back and more dangerous than ever, but now instead of just going after Rebecca and her mom, it wants to take Martin, which means that the family is going to have to pull out all of the stops to get rid of it, once and for all. At just a little over 80 minutes, Lights Out doesn’t get too bogged down in all the sorts of stuff that most horror movies of its nature tend to get a little too carried away with. For one, it’s not too concerned with its genealogy, or better yet, explaining all the sorts of stuff that happen – it trusts its audience to have a good idea that spooky stuff happens when the lights go off right from the get-go and that’s about it. The fact that the movie doesn’t try to make the force, or what have you, that’s terrorizing these people, into some sort of ancient folklore only known or talked about from crazy, old people living out somewhere in the middle of the mountains, also makes it even more refreshing, while also reminding us that this, first and foremost, a horror movie. Oh, T. It’ll be okay. And a pretty scary one, at that. Director David Sandberg and writer Eric Heisserer seem to come together perfectly on one aspect of Lights Out, and that’s how to handle the scares. Sure, the idea is a gimmicky one for sure, but it’s also one that’s handled incredibly well; we get a good sense of what the force does, how it does what it does, and how it could possibly be stopped, with still some questions unanswered when all is said and done. The movie doesn’t concern itself with the questions, the answers, or the reasons, but mostly just pays close attention to creeping people out with smart, random, but always effective scares. In fact, the movie works best perhaps when it’s just playing around with its certain rules and conventions, being stuck in its own little creepy world and not caring about much else. Sure, it’s good to have a story, characters, development, and heart added to the proceedings as well, but sometimes, when all you want to do is relish in your own scariness, then nothing’s wrong with that. Both Sandberg and Heisserer know exactly what they’re making, don’t try for anything more, and because of that, end up pulling off a solid little bit of horror. Of course, the movie does have characters and plot, which also keeps it away from being truly, if above all, great. Yeah, turn around, bro. Think that’s a pretty easy decision to make. But here’s the thing: The movie is so short and quick with itself, that all of the qualms about the acting, or the plot, or even the characters, may seem rather silly. The movie doesn’t take up a whole lot of time on them, but instead, building up the scares and scenarios. It’s admirable and smart, but the fact remains that these aspects of the movie are troubling and can sort of make the other 40 minutes of this flick seem rather, I don’t know, lame. Teresa Palmer is always great to watch, but even here, she seems like she’s not just forcing her American-accent, but some of her goofy-lines as well. Same goes for Maria Bello who, unfortunately, is stuck with the crazy, sometimes not-all-that-there mother role that likes to yammer on about things that may or may not be real, while also having nervous breakdowns left and right. It’s a rather obvious role and though Bello tries with it, there’s no getting past the fact that, yeah, it’s kind of weak. Still, like I said, the movie gets by solely on the fact that it’s short and sweet, so when you take all of these problems into consideration, it hardly matters much. They’re not around, but guess what is? 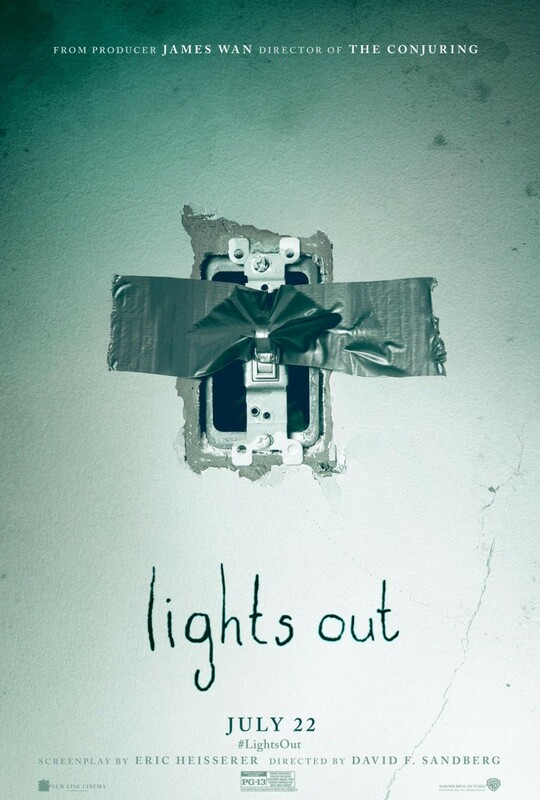 Consensus: While not perfect, Lights Out still gets by on the sole fact that its short, sweet, and pretty scary when it wants to be, making it the rare franchise-starter that’s actually interesting.